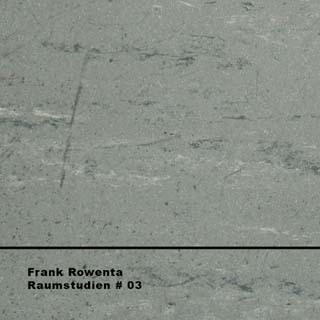 VITAL WEEKLY | number 562 – week 5 | "Raumstudien # 01"
CD Feature/ Frank Rowenta: "Raumstudien # 01"
Review by Tobias Fischer | tokafi | "Raumstudien # 02"
VITAL WEEKLY | number 648 – week 42 | "Raumstudien # 03"
Stephen Fruitman | sonomu | "Raumstudien # 03"
Prank? Dadaist commentary on other recordings of empty spaces? Two wasted hours of my life I will never get back? Punctuated by the regular "click" of an outmoded cassette tape recorder going round and round – whose tape hiss is all that is actually "recorded" – there is as good as nothing going on, and I mean that in every acoustic sense. Around the thirty-five minute mark of the first disc, some movement and conversation is heard in the murky background, and a tambourine is picked up and tested. Similar through-the-wall sounds can be heard around the forty-five minute mark of the second. Yes, it´s a two-CD set! The third of three two-CD sets which all sound the same. Luckily, I was proof-reading while listening, so the two hours were not entirely wasted.